Do you dread setting up your territories? If you manage sales reps, secret shoppers, or any other kind of team that needs to be deployed to different locations, then you know how long this task can take. It’s a real chore. But creating territories is fast and easy when you use Route4Me. 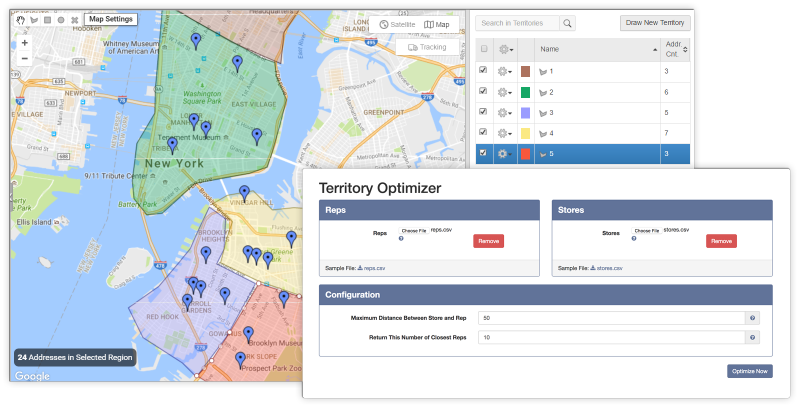 With our territory optimizer, all you need to do is plug in the locations of your drivers, the locations of your customers, and the maximum distance you want between your drivers and customers. Then, in a few seconds, your optimized territories will be ready. Instead of taking hours, creating your territories will take less time than tying your shoes. Another thing to consider when you plan territories by yourself is that the results won’t be perfect. Your drivers will end up using more time and gas than necessary. Route4Me’s advanced algorithms produce territories that make the best possible use of your resources. You’ll save money on travel expenses, and your team will be more efficient. Also, business is complicated. Your customers aren’t all the same. Your people aren’t all the same. You shouldn’t send out a new hire to meet with your biggest client on their first sales trip. No, you’ll want to assign one of your most experienced reps to that account. You can use territories on Route4Me to separate your VIP clients from everyone else. In fact, you can use territories on Route4Me for whatever you want. Define what’s important to you, then use territories to organize your operation and make sure those needs are met. Route4Me’s platform doesn’t just automate the process of creating territories based on your rules, but also automatically creates routes, assign routes, and evaluates performance. Route4Me is a seamless operational system. It allows you to create optimized territories, create optimized routes, assign drivers to territories, assign routes to drivers, track drivers in real-time, and much more. There’s no reason to go through the hassle of integrating several different services to get what you need. Not when you have Route4Me.